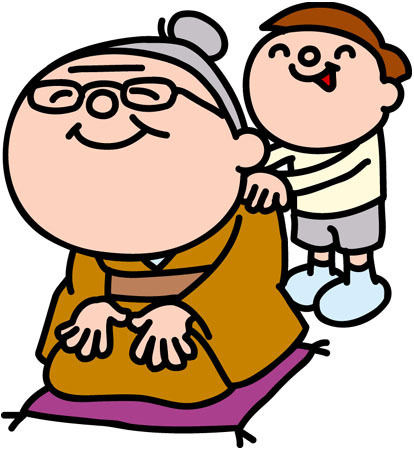 Last Monday was a holiday in Japan, called 「敬老の日」 (“Respect For The Elderly Day“). On this day, people often give gifts to their elderly parents or grandparents. Many kindergartens invite grandparents to have lunch at the school with their grandchildren. Shoulder massages are common "gifts" to grandparents on this day. Today is another holiday in Japan…「秋分の日」 (“Autumn Equinox“). On this day in Japan, and on the 「春分の日」 (“Spring Equinox“) in March, it is common for people to visit their family graves to pay respects. This custom is called 「彼岸の中日」 (“Higan-no-chuu-nichi“). The actual date of 「春分の日」 (Spring Equinox) and 「秋分の日」 (Autumn Equinox) varies slightly. Spring Equinox is around March 20 or 21 and Autumn Equinox is usually September 22 or 23. I read online that in 1931, the Autumn Equinox occurred on September 24 and the next time it will occur on that date will be in the year 2303. But in Japan, 「春分の日」 (Spring Equinox) is always celebrated on March 20th and 「秋分の日」 (Autumn Equinox) is always on September 23rd. The only time the dates change is when one of those dates fall on a Sunday…then the holiday is observed the next day. 「敬老の日」 (“Respect For The Elderly Day“) is celebrated on the third Monday of September. Last year that holiday and 「秋分の日」 (Autumn Equinox) were only one day apart, so the Japanese government made the day between them a one-time temporary holiday so that most people in Japan could have a five-day holiday period that was called “Silver Week“. Yesterday someone asked me if the Spring and Autumn Equinoxes were holidays in America like they are in Japan, and how they’re observed in America. I know that Spring and Autumn Equinox, as well as Summer and Winter Solstice in June and December, aren’t legal holidays in America. But they’re considered the date that the seasons change. Americans say that the first day of Winter is around December 21, the first day of Spring is around March 20, the first day of Summer is around June 21 and the first day of Autumn is around September 23. So, in America, today is the first day of Autumn. In Japan, the first day of every three months is considered to be the beginning of the next season. Winter, Spring, Summer, and Autumn each start on December 1st, March 1st, June 1st and September 1st, respectively. But maybe the American dates are more accurate. Because yesterday was a very hot and sunny day in Tokyo. It was about 33°C. But today is a bit cold and rainy. The temperature dropped down to 23°C! And tomorrow is forecast to be even colder…20°C. Another thing that is said about the equinoxes in America is that they are the only days of the year that you can balance on egg upright. I don’t know where that came from. But it’s an American urban legend that eggs can be easily balanced on the day of an equinox. How is Autumn Equinox (and Spring Equinox) celebrated in your country? (Also, if you want to know more about Japanese holidays, read my F.A.Q. ).